7	JPMorgan Chase & Co.
10	Bank of America Corp. If I was king: once a stock is purchased, you hold it for 30 days. This has been covered so many times. I don't know why, but this JL Collins fellow seems to be popping up more and more on this forum over the last week. Maybe he has a book coming out and is starting a marketing push. Anyway, use the search function for "why international stocks." I am sure many Japanese investors said the same thing in the late '80s/early '90s. That seems to be Jack Bogle's opinion as well. One reason why the answer to "how much international?" is "somewhere between none and half of your stocks". I will start using the forum search functions more. Collins comes up in my recent posts simply because I just discovered him this week. Fortunately, my VTTVX does include foreign components --- beyond any "foreign component" of U.S.-based companies. Saying that I own international stock because US companies do business overseas makes no sense. Owning a Total Stock mutual fund does not give me ownership of Nestle, Toyota, Royal Dutch Shell, or any of the other major corporations that are traded in non-US stock markets. I need to buy a Total International mutual fund to do that. (18.70% of total net assets) as of 10/31/2018 "
how diversified are you with 18.7% in ten holdings? "You already own international stocks with VTSMX?" I am a skeptic about international stocks--about 20-25% of my stock allocation is international, but I do not think it is of any great importance either way. But I really object to the wording "you already own international stocks" in VTSMX; is that your wording or Collins'? What's meant by "US stocks" and "international stocks" is perfectly clear. 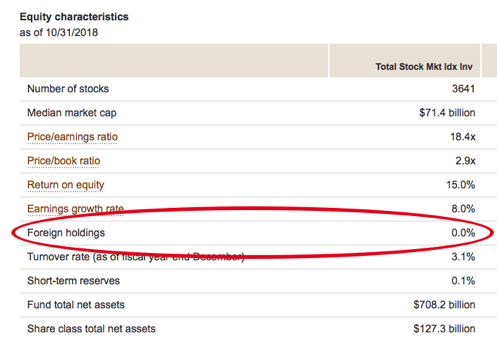 Vanguard's own wording is "Vanguard Total Stock Market Index Fund is designed to provide investors with exposure to the entire U.S. equity market" and that it contains 0.0% foreign holdings. No good is served by trying to shift or redefine terms that have good consensus definitions. If Collins is trying to do this, then he's being dishonest. He's grinding an axe, and you should not trust him. It's true that most of the money in the stock market is invested in large companies, and most of the large companies do a lot of overseas business, so most of the money in VTSMX is invested in "US companies doing global business." To the extent that in 2018 US business is globalized, and to the extent that stock performance is related to business performance, one might expect the US stock market to behave similarly to international stocks markets, which it has. When the US sneezes, the world gets a cold. And when China sneezes, the world gets a cold. And when Europe sneezes, the world gets a cold. Also, although I believe it is a great mistake to direct one's personal investments in accord with one's personal macroeconomic predictions, I think it does have to be said that if we believe that US policy is to move the US toward greater independence from the global economy, then--via a causal chain with too many weak links--we might expect US and international stocks might to move more independently in the future than they do now. Anyway, maybe international stocks are great diversifiers, maybe they aren't, maybe you "need" them, maybe you don't--but, please, let's not say that US stocks "are international stocks." Last edited by nisiprius on Sat Dec 08, 2018 2:20 pm, edited 2 times in total. In one of the interviews with JL Collins on Youtube he makes an argument against the need to explicitly include international funds or stocks in your portfolio, since broad-based index funds include big "U.S." companies with significant international business. There are very explicit rules which determine the definition of a "U.S. Company". For the purposes of an index, those rules are defined in its methodology. Let's take a look at the S&P Total Market Index - S&P Dow Jones Indices. Tap / click on the "Methodology" drop-down and download the "S&P U.S. Indices Methodology". Page 5 (page 6 in the PDF reader) has the eligibility factors. Here's the basic definition for "U.S. company". See the full document for more info. 1. Files 10-K annual reports. 2. The U.S. portion of fixed assets and revenues constitutes a plurality of the total, but need not exceed 50%. When these factors are in conflict, assets determine plurality. Revenue determines plurality when there is incomplete asset information. 3. The primary listing must be on an eligible U.S. exchange as described under Exchange Listing below. If a company meets the above criteria, and meets the other financial criteria to be index, it's listed. Otherwise, it's not. This comes up frequently, perhaps we need a clear explanation of the difference between international stocks and domestic stocks with foreign operations/investments/holdings -- in a place where people will actually read it. JL Collins isn't the first person to say this, and he's not the first person to be wrong about it. It's a common rookie mistake, which suggests maybe JL Collins isn't worth paying so much attention to. VTSMX is a closed fund. You should really retire the Investor index share class tickers. The relevant ticker is VTSAX. And fund names are better in subject lines anyway. It wasn't hard to guess what VTSMX was, but I had to open the thread to be sure. +1 It's a frivolous argument not worthy of the endless discussions on Bogleheads. I hold weak convictions about investing internationally (I still do it), but I don’t think the notion that large US companies do considerable business overseas is a meaningful argument in this context either way. It isn’t one of the boxes I would check if I were making the case against investing internationally. I read his book. It's a good one BUT I disagree with his international arguments. If you can look past that, the book is pretty good. I recommend "The Simple Path to Wealth" by JL Collins. I agree with Colllins' views on international investing, found in Chapter 15. He states that the 500 largest stocks in the U.S. make up about 80% of VTSAX, and that those 500 stocks generate half of their revenues/profits from markets outside the U.S.
Japan generates close to 60% of their profits from overseas. Were I a Japanese investor, I'd still invest overseas, because I'm looking at the companies, not just the exposure. Here's the video where he mentions the impact on U.S. companies due to international business -- I think it's towards the end in response to audience questions. Personally I would just have to decide whether to pay more attention to people like Collins or the many experienced, thoughtful investors here. Very quickly, the thought that changed my mind from the Jack Bogle bias of the S&P500 companies doing something like 40% of the business outside the USA is that when you look a industry segmentation, the US is very heavy in a couple of key segments such as High Tech and Financial Services... By buying ex-US stocks, you are getting more than just diversification of place of business, but also type of business. That is a very important diversifier. I am quite soft on ex-US stocks overall for lots of reasons, but I keep 20%+ in allocation. Wrong about what? The need for international stocks in your portfolio? Isn't this the same as Jack Bogle's opinion on the matter. How do we know who's right and who's wrong? Sometime in the early 1980s, the America Abroad fund bought only the S&P500 stocks that had more foreign revenues than the other S&P500 stocks, saying their fund had foreign exposure with USA accounting regulations. The fund did not track with directly owned foreign stock funds because the Am. Abroad fund's stocks were traded on the US stock exchanges and tracked just like the other S&P500 stocks that did not have foreign exposure. The logic was good but it did not cross over to the buyers and sellers of the individual stocks in the S&P500, so no benefit. Extra foreign exposure did not produce any price differences from mainly US exposure. If an investor wants foreign exposure, foreign stocks will have to be owned. Another consideration is whatever is hurting US businesses will likely spread to non-US businesses. Again the lesson from Japan, the entire global economy fell but the Japanese economy did not recover when the other economies did. The recession was not avoided, the lack of recovery is hopefully avoided. Wrong about US stocks providing “international” diversification by virtue of some minority of their revenues coming from overseas operations. It’s an empirical question that has no evidentiary support. The fact that major US corporations do a significant amount of business abroad only provides international diversification (and I use that term loosely in this context) if the US retains its position as the dominant world economy. If the alternative occurs, and the US loses its dominance, domestic companies may continue to do 30-40% or more of their business overseas, but their share of the overall market will be steadily declining. Without owning shares in the new foreign growth companies they are losing out to, you lose out on those engines of growth. So what if you have 30-40% foreign sales in a declining company? This seems so obvious to me that I’m not sure what someone like JL Collins, or Jack Bogle for that matter, is missing when they make claims like this. We should own shares of foreign companies for diversification in case the US position in the world economy declines, not because we should expect it to increase our returns. I doubt Jack Bogle missed anything. Why? Because he knows everything about everything? He deserves all the respect in the world for what he accomplished at Vanguard, but there are plenty of things he’s said that just aren’t true. he suggests adding Vanguard Total Bond to taste. He speaks not of Early Retirement, but of F-U money making you independent. His book is a good read, with a lot of common sense. He knows more than most and certainly more than me. I don't know about "everything about everything" though. What does that have to do with owning stocks domiciled and listed/traded in foreign jurisdictions? Taiwan Semiconductor Manufacturing Co. Ltd.
A US-only total stock market index fund won't help me invest in these companies. So many good companies I own a piece of. Not to mention that doing business abroad is not the same as winning abroad. Second, a lot of international companies have sales in the US. So what's your point? Any portfolio without exposure to Nestle, Shell, Roche, Glaxosmith Kline, Bayer, BP, Unilever, Taiwan semi conductor, HSBC, Barclays, and many more household names is an incomplete and lopsided portfolio. You can choose to invest in this manner of you wish, but I really wish people would stop proselytizing this religion here. There are a lot of slice and dicers on this board but you don't see them keep posting how great it is every week. Whenever I see these posts I feel the poster isn't confident in his beliefs and is looking for validation. I don't know who that is but many people on this board make the same argument, and I've never understood it. By the same logic if you have total international then you already have domestic US stocks because Toyota, Shell, Glaxo, etc have substantial US businesses. There are reasons one could have to favor domestic over international stocks, but I think this particular argument is entirely fallacious. A popular argument. When you compare many of these companies to their US-based competitors they often perform just as well if not better. Yet these companies belong to the same index that has under-performed the US for the last 10 and 20 years. While I do invest internationally, it does make me question the haystack I'm buying. That's why Charlie Munger says investing is simple but not easy. Between 2000 and 2010, US stocks under performed international. There's no reason why that couldn't happen again, and for a much longer time frame. Diversification is not intended to maximize returns. When you are diversified you will always go through periods where you feel like you should be more heavily weighted towards one asset class or another. Perhaps the most difficult part of long-term investing is recognizing this behavior and not modifying ones portfolio based on those emotions. "You already own international stocks with VTSMX etc ???" I haven't been aware of JL Collins long enough to evaluate his expertise, but was just passing on what he seemed to be implying. Whether or not he is considered an expert on investing, there's no question there is a lot of skepticism these days of those purporting to know something about something. Your friends' scoffing brings to mind the quote often attributed to Mark Twain: "It ain’t what you don’t know that gets you into trouble. It’s what you know for sure that just ain’t so." The only times I've ever warmed up a fuel-injected car for over 30 seconds was when we lived in a very cold climate. On -20 degree mornings I would warm up my wife's car so it would be toasty inside when she got in it to go to work. The brownie points I received were well worth the engine and environmental damage I did. Yes, I've been trying to tell people I hold only international stocks for that reason, but for some reason my argument hasn't seemed to win anyone over. Could it be because of the poorer recent performance of international? this JL Collins fellow seems to be popping up more and more on this forum over the last week. Maybe he has a book coming out and is starting a marketing push. Agreed. Can the mods look into this? If it is the author or someone connected to them posting these repeated quotes about this random individual trying to score some new followers/ buyers it should be prevented. We have many folks who have main or side hustles in personal finance and they do an excellent job of not exploiting this site to sell themselves. This is silly. JL Collins is a blogger whose audience is novice investors. He writes about living below your means and tries to make investing easy to understand. He has kind of a folksy way of writing, that if it works for you, can really resonate. I found his blog very helpful when I was getting started and still enjoy his writing. So far as I know he makes money from ads on his sight though they’re not especially prominent (he also runs some sort of international retreat and...well if that’s your thing). He is very clear that everything in his book can be read for free on his blog. JL Collins’ stance on international is that you don’t need it. But if you’d like to invest in international, anything between 0% and roughly 50% would be reasonable as a guide. I find it frustrating that OP (in my mind) mischaracterized his stance and then used it as a basis to start another “why international” thread. OP do you have a question that can’t be answered by the other recent “why international” threads? There’s no need to look into if JL Collins is trying to manipulate the Bogleheads forum to get page views or something. But if there were to be an investigation, then I suggest mods start with Taylor's Investment Gems: viewtopic.php?t=201953#p3094156. This thing goes all the way to the top! Last edited by dorster on Sun Dec 09, 2018 11:37 am, edited 1 time in total. .. this JL Collins fellow seems to be popping up more and more on this forum over the last week. Maybe he has a book coming out and is starting a marketing push. Last edited by Taylor Larimore on Sun Dec 09, 2018 11:36 am, edited 1 time in total. Agreed. Jim Collins is not trying to sell books using the Bogleheads forum. Everything in his book released more than a year ago is free on his blog. He offers simple, common sense advice largely inspired by Jack Bogle. Seems like something that should be embraced on the Bogleheads forum. Not sure if I am right but when I went with the 3 fund 3 years ago I decided on 20% of my stocks would be international. I am now down to around 18% now and may decide to not reballace in January. I will just let if ride and if it goes up good if not who cares. I am more concerned about my overall AA which I have lowered over the years from 100% stock funds to 50/50 AA. I may even let it ride down to 40/60 AA but not highter than 50/50 AA. I just don't want to risk any more. So, I believe the overall AA is more inportant. As for my 22 yr old son I advised him of the Target Dated Fund for his Roth IRA. This is much higher percent in international. So, I am going with the pros who believe this is correct. I also beleive that if they find they are wrong the will lower the percent in international. But more important there is no mistakes for him to make in investing. He has to just fund the Roth. And the AA is declined over years for his age and risk. So again, the thinking AA is more important. And for him the mistakes along the way. Anyway, my thinking but what do I know?? Last edited by indexonlyplease on Sun Dec 09, 2018 11:55 am, edited 1 time in total. It’s worse than I thought! After a fortuitous meeting in a Rosslyn parking garage, it’s been brought to my attention that it’s not only Taylor trying to bring JL Collins to the attention of those interested in “Investing Advice Inspired by Jack Bogle”. Jack Bogle himself may be trying to get those interested in “Investing Advice Inspired by Jack Bogle” to read JL Collins' book! Note this may all be a false flag operation to get us to stop buying Camrys. But real talk, this is a good book and I think the free Stock Series on his website is a good introduction to investing. Especially for younger folks. Yes, it could be, taking into account the performance of the international haystack versus the U.S. haystack over the past 22½ years. The inception date of Vanguard Total Stock U.S. Stock Market Index Fund (VTSMX) was 4/27/1992. The inception date of Vanguard Total International Stock Index Fund (VGTSX) was 4/29/1996. Per Morningstar, as of 12/7/2018, if you had invested $10,000 in both funds on 4/29/1996, you would currently have $61,179 in your Total Stock U.S. Stock Market Index Fund, which would be more than double as much as the $25,804 in your Total International Stock Index Fund. Of course, past performance does not indicate future performance. Stop listening to JL Collins. If you believe this line of thinking, then why not do the inverse and buy only international stocks since they do business with the US? I think it's just a way for people to justify what they want to do, that being not invest in Internationals because of poor recent performance. If they were outpacing US stocks, we wouldn't be hearing this kind of talk. "How Much International Stocks? A Suggestion."